Martha Berry writes to Dr. J. H. Kellogg inquiring about him coming to the Berry Schools to give a lecture to her students. She also writes to him about two of her female students who wish to become nurses and asks about the possibility for them to get funded to study with Kellogg. 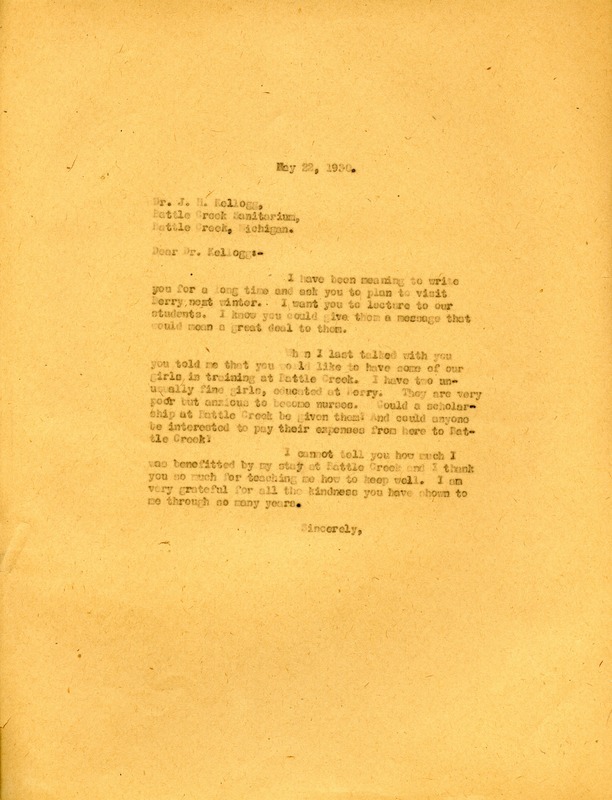 Martha Berry, “Letter to J. H. Kellogg from Martha Berry.” Martha Berry Digital Archive. Eds. Schlitz, Stephanie A., Chelsea Risley, Austin Amandolia, et al. Mount Berry: Berry College, 2013. accessed April 25, 2019, https://mbda.berry.edu/items/show/13051.